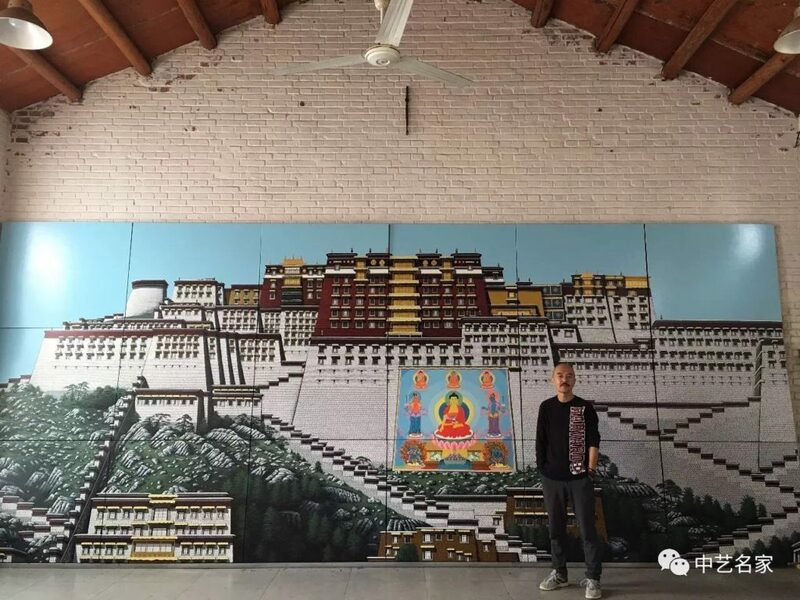 Liu Yi in front of his painting “Potala Palace”. 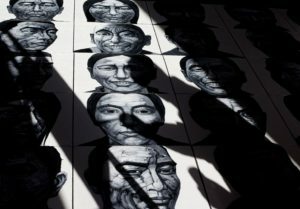 From April 16 to 25, Liu Yi’s exhibition “Sherab’s Pilgrimage” was held in Beijing. The curator, the art critic Shuai Hao, writes in the preface: “‘One hundred thousand leaves / Seem to cover both shoulders’ — from a young Qinghainese to a Song Zhuang artist, all the way to Potala Palace, Liu Yi has been on a 20 year long pilgrimage. He made it into the verse of one of Woeser’s poems. Leaves and light intertwine on the shoulders of the already middle-aged ‘Sherab’. His artistic pilgrimage is a special and rarely seen one. Read more about artist Liu Yi on this profile on Hyperallergic. The English translation of “A Mala that was Meant to Be” used in the article below is by Ragged Banner, taken from the still excellent poetry volume “Tibet’s True Heart”. At the time, I received a few photos from Lanzhou, showing many colourful Buddhas and Bodhisattvas looking either serene or angry. These photos were not taken in a monastery, but actually painted by a painter whose Tibetan name is Sherab. This person is Liu Yi. We once met in Lanzhou. I had heard that he is a Buddhist. The next time I met Liu Yi was in Beijing, around 2001, at an art exhibition in Deshengmen. Liu Yi’s paintings stood out, they were titled “Cessation and Observation”. “Cessation” comes from Zen Buddhism, while “observation” from Prajna. The Indian Bodhisattva Asvaghosa said: “Now, if he practices cessation only, then his mind will be sunk in self-complacency and he will be slothful; he will not delight in performing good acts but will keep himself far away from the exercise of great compassion. It is, therefore, necessary to practice observation as well.” Artists like Liu Yi are able to use colour and brushstrokes to gradually make the process of meditation come to life on an empty canvas; the audience lament maybe because they cannot see much in the paintings, but this is precisely what “cessation” is about and the so-called “observation” has nothing to do with the audience, it is only related to Liu Yi himself. After all, meditation is a personal matter. But now more deeply moved. A tree that has no equal. As if settling on a pair of shoulders. Maybe, Liu Yi also had a similar happy feeling before. We live in an era characterised by “exile”. 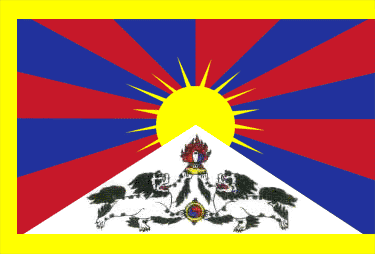 I consider myself an exiled Tibetan living in this imperial capital. Is Liu Yi also in exile? Or to phrase it differently, the artist’s heart is always in a state of being in exile. He doesn’t live elsewhere, but his spirit is elsewhere. The autobiography of His Holiness the Dalai Lama, “Freedom in Exile”, goes beyond bitterness and is full of joy and the greatest beauty. It is the highest possible state of exile. Cessation and observation has been a key theme of Liu Yi’s paintings for many years. Of course, meditation is a lifelong practice, it stretches and follows through lives and generations. In the complicated places of this secular world, however, when one finds oneself in exile, how can one maintain one’s karma? There are many Buddhas and Bodhisattvas in “Cessation and Observation” and the earlier works are like Tibetan thangkas. “Thangka” is Tibetan. “Thang” has a spatial connotation and means vast and unbounded. A thangka master once told me that on one canvas one can paint hundreds, even thousands of Buddhas, but one can also paint just one. A thangka painted with respect makes people feel Buddhism’s love for all living things. Tibetan Buddhists treasure thangkas, they carry them along with them as a movable temple, a place to worship. For people today, the thangka is used for praying, worshipping and meditation. When someone passes away, Tibetans would pick a thangka with a special meaning according to the divinatory diagram; the painting contains a deity that will protect the deceased during the bardo stage. Every monastery is full of thangkas that comfort and guide people throughout their lives. The biggest thangkas come out on auspicious days, unfolded, they can cover an entire mountain side. Liu Yi’s “Cessation and Observation” is no longer a thangka, he has created his own school, which displays his own practice and contains personal elements of love and beauty. Two of his paintings hang at my home, which is not far from Liu Yi’s home. Often when I kowtow towards my little shrine, I feel the beautiful Buddhas and Bodhisattvas accompanying me, they comfort my often sad heart. For me, writing poems is like searching for a memory of previous incarnations. So I hope to fulfill the following mission with my poems: I write to travel; I write to pray; I write to bear witness. Liu Yi, in contrast, said: I love and long for a different incorruptible and fine world, but I also pity and lament this vulgar and torturous world. Real artists never just lock themselves in the ivory tower, real Buddhists never just leave behind the mortal world. Encountering Buddha in all people surrounding us….